To keep your Invisalign treatment on schedule, you must wear your aligners for at least 22 hours a day. The more frequently you remove your aligners and the longer you keep them out, the more setbacks to your treatment there will be. Patients who do not comply with consistent wear, find that treatment will take much longer than anticipated. To help remedy this issue, Invisalign Teen aligners have compliance indicators on them that make it easier for the orthodontist to tell if their patients have been following directions. Compliance indicators are small blue dots on the backs of the aligners, where they’re not visible when the aligner is worn. Over the course of the two week period the aligners are worn, the blue dots gradually fade away. So if you’ve worn the aligners as you should, the blue dots will be completely gone at the end of two two weeks. If a patient comes in for checkups and the orthodontist consistently sees the blue dots are still there, they’ll know that the patient is not following directions for aligner wear. This will give the orthodontist an opportunity to remind the patient and their parents about why it's important to wear the aligners as recommended. The orthodontist may discuss other treatment options, like traditional metal braces, if the patient can’t or won’t comply. The compliance indicators also tell the orthodontist if the treatment is effective. For instance, if a patient has been diligently wearing the aligners as prescribed, yet the desired or expected tooth movement is not happening at the rate it should, adjustments can be made to the treatment plan. The compliance indicators can also help the patient stay on track with treatment. 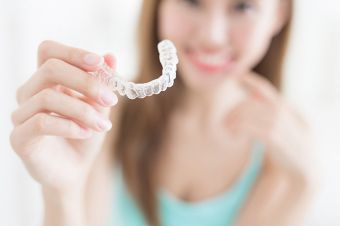 The aligners have been carefully calibrated to achieve a specific tooth movement during each stage of wear. Changing to a new aligner before your mouth is ready, or leaving a given set in for too long, can actually slow the treatment process. If the patient has been taking their aligners out more often than they should be, or leaving them out for long periods of time, it can be all too easy for them to lose track of how much longer they need to wear that particular set of aligners. Since compliance indicators will only fade away after a the aligners has worn for a full two weeks, it will make it easier for the patient to pick up where they left off. To learn more about how Invisalign Teen can help you or your teen get the smile they deserve, contact our Surrey & North Delta dentists today!